As customers in search of quick meals have recently turned to the Chipotles, Panera Breads, and Starbucks of the world, no chain has felt the circling sharks as much as McDonald’s. Since 2012, McDonald’s has lost 500 million visits in the U.S., and the Oak Brook, Illinois-based company has deemed “menu innovation” as one of its pillars to win back customers. One such effort has been its new Signature Crafted Recipes line, which plays catchup with the more daring flavors that McDonald’s competitors have utilized. By no means are we talking about the ambition of organic braised tofu or ancient grain flatbreads, but the fact that a behemoth like McDonald’s is including lime wedges with its guacamole chicken sandwiches is newsworthy in itself (the frork, a dumb promotional stunt we didn’t take part in, certainly isn’t). 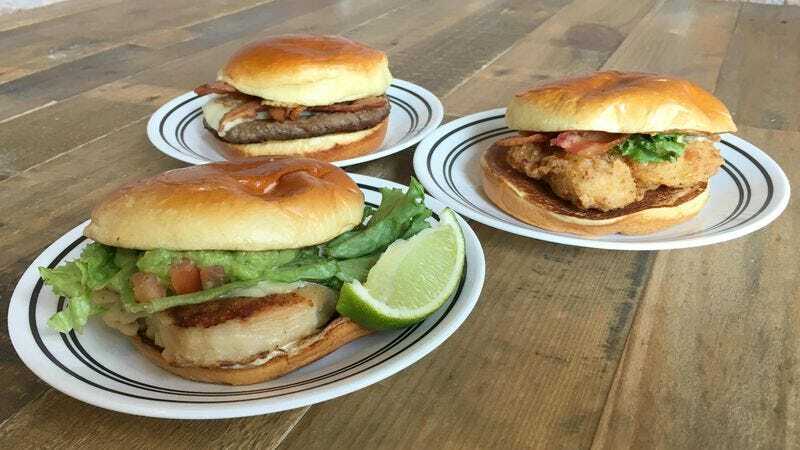 What’s being introduced here are three toppings—pico guacamole, maple-bacon dijon, and sweet BBQ bacon—which customers can mix and match with its quarter-pound beef patty, grilled chicken, or buttermilk crispy chicken patty. For the purpose of this taste test, we paired toppings and proteins that seemed natural together (guacamole goes with grilled chicken, barbecue sauce and beef). Of the three, the maple-bacon dijon was the least memorable—not because it didn’t taste delicious, but because dijon is one of those nuanced flavors that doesn’t directly ping the pleasure centers in your brain. This sauce—a good balance of sweet, smoky, tangy, and earthy—would make a fine vinaigrette, but on a chicken sandwich it doesn’t quite punch through to the forefront. But the real story is the buttermilk crispy chicken, leagues superior to the rubberized meat puck of a McChicken patty. The way that it’s fried, it has the bumpy texture of panko breadcrumbs—think a lighter fry job than Chick-Fil-A’s. It also looks like chicken, to the degree that chicken from a multinational conglomerate can: It has a shape and texture, oblong and natural, and not seemingly from a die-cast circular mold. It’s a nicely fried piece of chicken cutlet, one that could be served as a schnitzel of chicken tonkatsu, with few being able to tell the difference. Surprise No. 1: This sandwich was accompanied by a lime wedge to squeeze over your guacamole. Surprise No. 2: The guacamole isn’t monochromatic and dull, as I distinctly picked out notes of cilantro, tomatoes, and the lime juice amid the Hass avocados’ creaminess. Surprise No. 3: The tangy buttermilk ranch dressing sort of pairs with chicken and guacamole! Surprise No. 4: The dreaded grilled chicken breast, normally a synonym for dry blandness, was in fact meaty and moist. What was perfectly serviceable: The artisan roll, which appears to be a brioche but less eggy and buttery, but which nevertheless bears an attractive sheen on its crown. What was disappointing: The lettuce, which under chicken heat plus guacamole, is rendered into a warm and soggy mess. That’s four pleasant pluses, one wash, one negative. That’s a net positive for me.